Day 218 / Hat 218: Green, 100% cotton baseball-style cap with gold embroidered outline of the state of Vermont (edged in white embroidery) on front and additional gold embroidery on back that reads: "State Traditions" in all caps. Based in Birmingham, Alabama, State Traditions creates top-notch, state and country-inspired apparel and accessories that reflect traditions across America and the world. The brand is the brainchild of friends Keith Brown and John McElrath, who were looking for a creative way to showcase their state pride both around town and at the stadium in the summer of 2007. Nonetheless, the name got my brain moving in a different direction (as my brain Is wont to do) and I started thinking about state traditions in general. Just off the top of my head (almost literally), Vermont's state traditions might include town meeting day, mud season and the mischievous practice of cow tipping -- though, as I've said many a time, I spent 30 years there and never actually saw a cow tipped or heard an earnest first-person confession of same. I'm sure other Vermonters (aka "you shoobs") have additional traditions to add -- if so I encourage you to share them in the comments below. Same for you folks hailing from the other 49 as well. What does your home state do that none of the rest seem to do - or do as well? 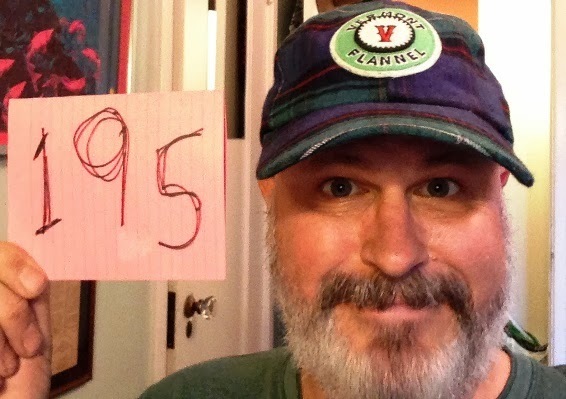 I tip this penultimate hat of 2013 to the great state of Vermont, "Stella Quarta Decima," and its traditions -- new and old. 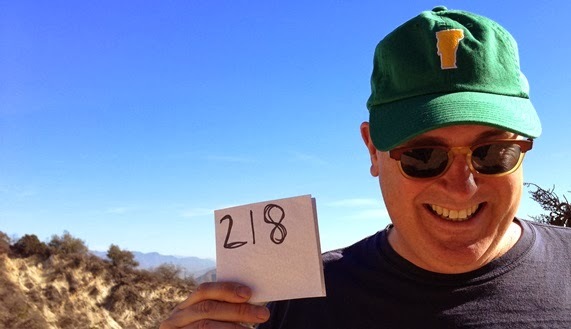 Day 211 / Hat 211: Green, 100% loden wool Bavarian Tyrol hat with three-dent crown, two-inch brim Lodenhut. A pre-Christmas gift to the Project from my sister-in-law who found it at Orvis (here's the store's link), I discovered a couple of things in researching this hat. First, Lodenhut (according to this description) was founded by one Konrad Stepanak and has been making headgear like this in Germany for some three generations. Second, there isn't just one kind of Tyrolean hat -- there are several. 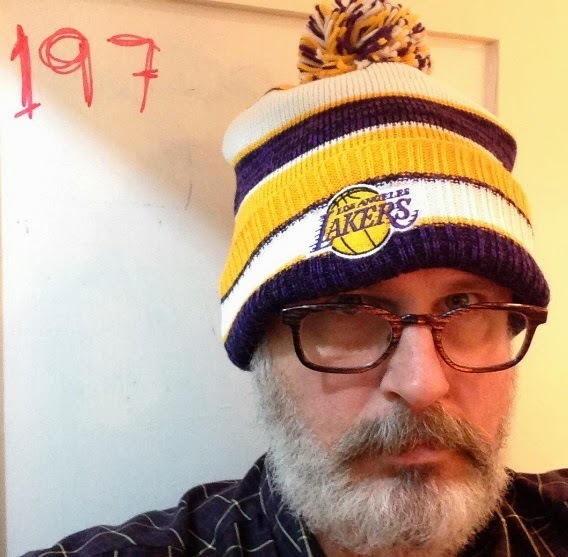 Long-time readers may remember I featured a "vagabond-style" Tyrolean hat back at PC 02. The narrow brim and dented crown apparently make this the style prevalent in North Tyrol. North Tyrol for anyone who didn't know (I confess, I did not) is part of the Austrian state of Tyrol and according to this Wikipedia entry, borders Salzburg to the east and the Bavarian state of Germany to the north. This style of hat, the interwebs tell me, is different from those toppers traditionally hailing from South Tyrol which apparently taper to a point on the crown and have a brim the width of a hand (so sayeth the Wikipedia entry on Tyrolean hats). Here's an example of that hat from an 1834 painting titled Knabe mit Tirolerhut und Äffchen (which translates as Boy with Tyrolean hat and monkey). So today's Tyrolean hat-tip goes to 'Thleen who is steadily moving into a hat-donor class all her own. Day 210 / Hat 210: Forest green trucker-style hat with mesh back and foam front. White embroidery on front reads (in all caps): "Knights of the Round Table, Wayside Country Store, Arlington, VT," with knight mascot in the center. 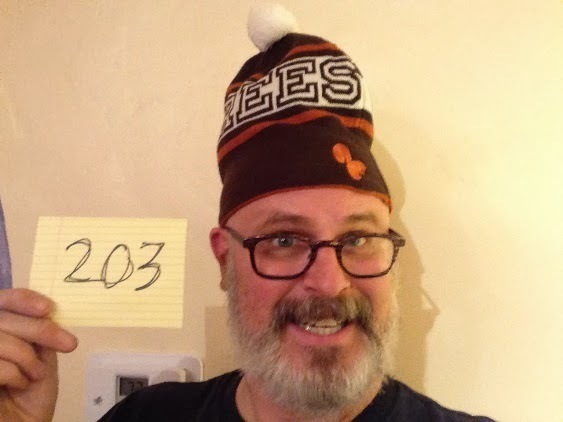 Yes, this is the second Wayside-related hat in a row, but hey, the road to 500 is a long one and a cat's gotta hat where he can. Who are the aforementioned knights? Despite the look of the mascot (which to me screams -- make that chants -- Midwest college football) they aren't a sports team. The Knights of the Round Table are the group of (mostly) men who congregate at the large, round plywood-top table between the deli area and my dad's S-curve rolltop desk at the Wayside starting at 4:30 a.m. on any given morning. A rolling, loose-knit fraternity of crotchety armchair politicos, the one thing you can count on about the knights is that to the one they've got opinions and those opinions will be shared, vented and batted about around that table. Even if the tablecloth that covers it were stripped away the table wouldn't be much to look at, but it has backstory as deep (if not deeper) than those who cluster around it, having come from the Sandgate hunting camp of a famed hunter/fisherman by the name of Lee Wulff. Over the years, the knights and I have not always seen eye-to-eye on things (usually politics) and I remember one morning years ago when I was opening the store one fellow (Ray Smith, I think) got me so agitated I accidentally poured two pots of water into the one-pot coffee maker. Still, the knights have character and if there's one thing I like as much as fantastical headgear it's character, so today's sincere hat tip goes to the Knights of the Round Table at the Wayside Country Store. 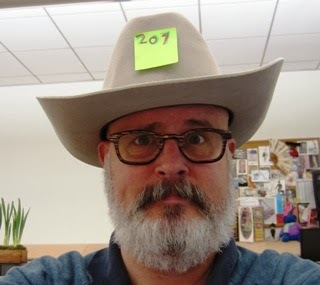 Day 207 / Hat 207: Gray Stetson cowboy hat with gray grosgrain hat band. Interior printing reads: "XXXXXX, Stetson, Made in USA," and size tag reads: "7 1/2." Brim measures approximately 3 1/2 inches and crown is 4 inches from brim to dimple. 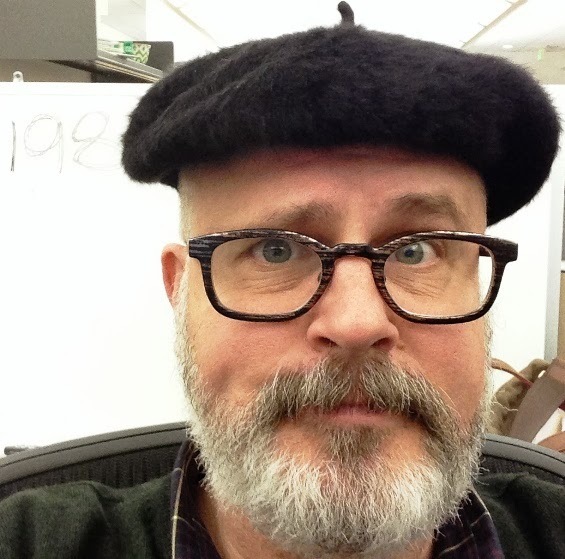 While I couldn't immediately identify this particular hat on the storied brand's website, I was able to identify the shade of gray -- which Stetson calls "Silverbelly." This is the second loaner lid from Lisa B. (the first was yesterday's Clone Trooper helmet) and I wanted to make sure I included it in the Project before it got lost in the holiday shuffle. It is also happens to mark the second Stetson to be featured here -- the first was some 157 hats ago with PC 50 back in July. 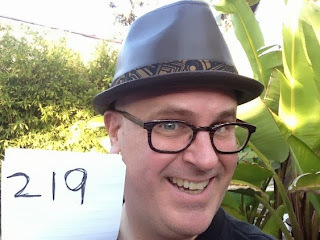 The quality of the hat body used to make a hat is the main factor that determines the X’s. 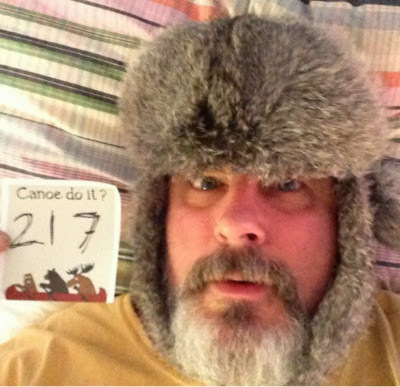 In felt it is determined by the percentage of fur’s [sic] used in making the hat body. We use beaver, mink, chinchilla and other animal fur to make bodies. The mixture of which furs we use determines the X’s. Never mind the Xs, though, today's tip o' the ten-gallon goes, as it did yesterday, to Lisa Boone. 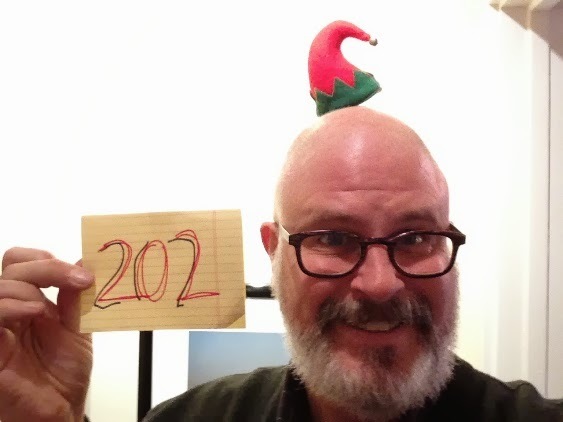 Day 205 / Hat 205: Red and green polyurethane foam Christmas elf cap with red bell and Christmas light details. When a button on the side is pushed, a mechanism inside the cap starts playing the song "Jingle Bells" and the bell-festooned tip of the cap starts flopping back and forth like a beached carp. Interior tag reads: "Dan Dee Collector's Choice, made in China." I chose this hat (which I believe was originally procured by 'Thleen) for today since it's the annual Features section holiday potluck lunch and this treads -- and then quickly crosses -- the festive/annoying line. Since it's the motion of the millinery that makes this lid so magic, I couldn't resist including a video of it in full flapping glory (the fancy camera work is courtesy of the Bride). It's embedded below, and if it doesn't put you in the creepy office party holiday mood then I don't know what will. 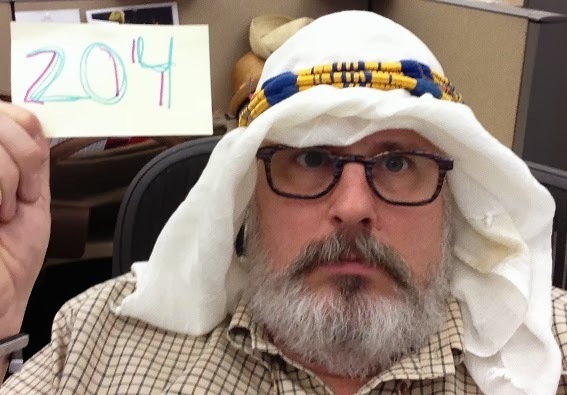 Day 204 / Hat 204: White cotton keffiyeh held in place with a with blue- and gold-colored agal. Perhaps the oldest piece of headgear in my possession, my friend Eve brought it back for me as a memento of her trip to Israel and Egypt in the summer of 1985 after spending a year studying abroad in France (we'd met during my freshman year at UVM). I've had this special piece of headgear ready for the Project since wearing it on Halloween, and when I heard that Peter O'Toole had passed away on Saturday, I knew it would be an appropriate homage to the"Lawrence of Arabia" star, who could rock the keffiyeh like no other actor before or since. Peter O'Toole in "Lawrence of Arabia." "British Colonel T. E. Lawrence (better known as Lawrence of Arabia) was probably the best-known Western wearer of the keffiyeh. He wore a plain white one with agal during his involvement in the Arab Revolt in World War I." A little trivia for you: it apparently takes its name from the city of Kufa (currently in modern-day Iraq near Najaf) and alternative names for it (the headdress, not the city) include ghutrah and shemagh. 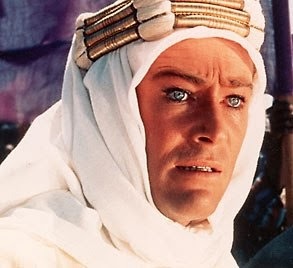 While today's hat tip goes to my dear friend Eve for the memento from many moons ago, we feel it necessary to momentarily doff our keffiyeh in the memory of the later, great Peter O'Toole. 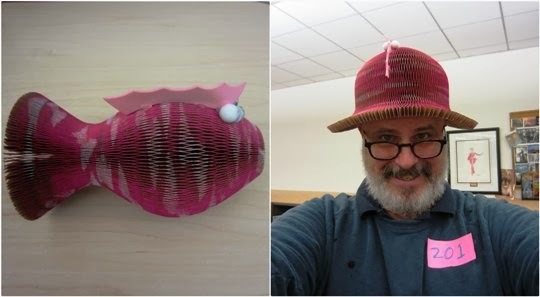 Day 201 / Hat 201: Pink and white corrugated paper fish decoration with pink foam top fin and plastic eye details that folds out into a full-blown hat! Possibly the coolest of the series to date, this piscatorial piece of headgear was loaned to the Project by our Travel section editor Catharine Hamm (who previously provided PC 71's hachimaki). She says she picked this sea creature up back in October at the Village Venture Arts & Crafts Faire in Claremont, Calif. Although I've tried to give you an idea of what it looks like before and after in the above photos, it's the kind of thing that begs for a video of the transition from decoration to headgear which, at first, made me sad that I'd left my trusty iPhone at home today. Then I found the below video on Youtube which is even better for several reasons. First, dude man has a British accent. Second, he seems deadly serious about his demonstration. Third, at the end of the video he puts the hat back on in a way that makes me laugh really, really hard. 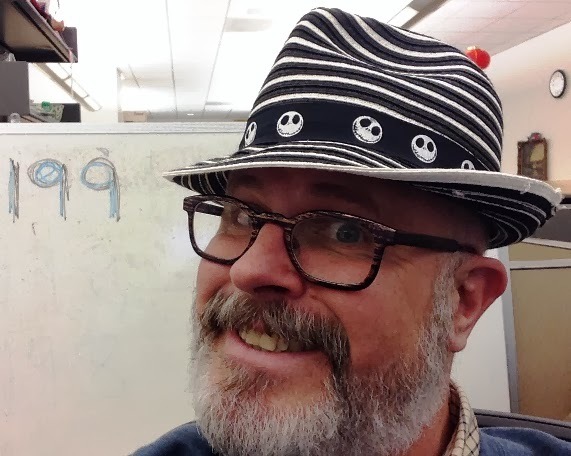 So, today's hat tip goes to Catherine Hamm for her gracious loan of an awesome creation -- and random Youtube video guy for bring a little lid-related levity into my day. Day 200 / Hat 200: Black, baseball-style snap-brim hat with red button on top, red, black and white embroidered Rolling Stones lips and tongue logo on front, red and white embroidered "50" on wearer's left and "The ROLLING 5T0NES" embroidered on back. Interior tags read: "The Rolling Stones 50 Years" and "2013 Musidor B.V. Under license to Bravado Merchandising. All Rights Reserved." 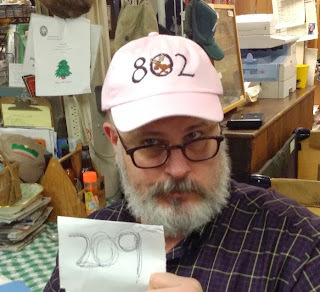 Loaned to the Project by Team Boucher, I felt it was an appropriate milestone hat for number 200 since the Mick and the boys have reached a milestone of their own, rolling as they have for a full half-century now -- well 51 years at this point (the band formed in London n 1962).. I couldn't resist including a little background on what may be the most famous logo in rock 'n' roll. Designed by Jon Pasche in 1970, and first appearing on the band's Sticky Fingers album, the original artwork is in the collection of the Victoria and Albert Museum, which bought it at auction for $92,500. "Pasche was commissioned to produce the logo after Jagger approached the Royal College of Art in London in 1969 to help him find a design student - the Stones had been frustrated by the bland designs offered by their record label Decca Records. Subsequently, Jagger visited Pasche's degree show and this led to discussions for a logo and other work for the Stones's own label, Rolling Stones Records, after the group's contract ended with Decca Records in 1970." So it's a hat tip to Team Boucher, a shout out to the Stones as I keep on rolling toward 500 hats. Oh, and I don't usually tip my hat hand but I've got to say tomorrow's hat is going to be something really, really special. 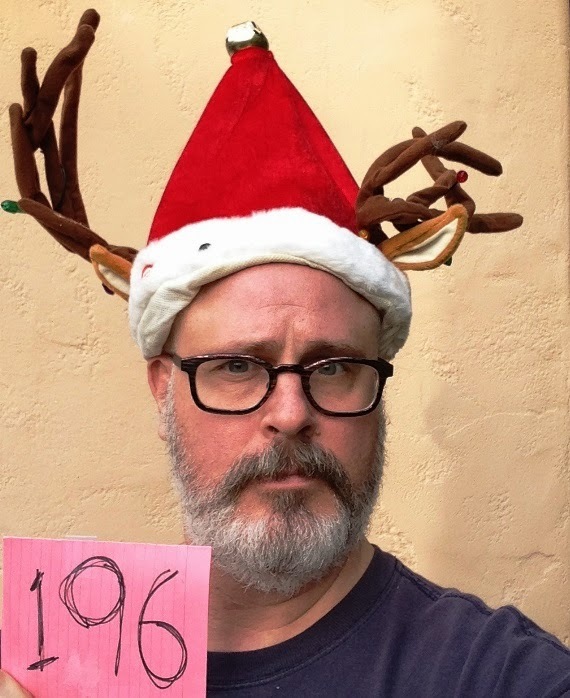 Day 196 / Hat 196: Red Santa Claus cap with white trim, functional bell on top as well as a pair of reindeer antlers (and two tiny brown ears if you look carefully enough) festooned with functional blinking Christmas lights. This is one of my favorite pieces of holiday headgear of all time not only because it's a guaranteed attention-getter but also because I was wearing it at Heather's annual holiday party some years back while my sainted mother was visiting from back east and my mom hilariously noted: "I birthed that reindeer! 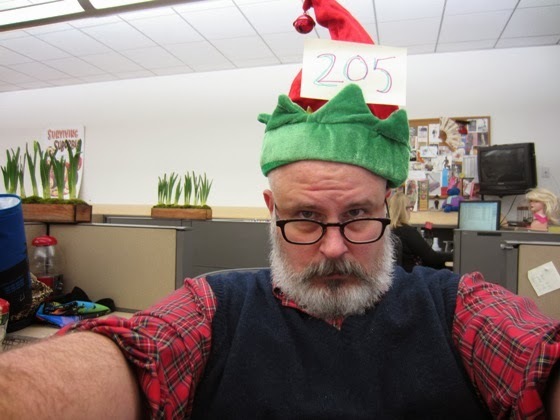 "* made a comment along the lines of: "I gave birth to that reindeer and wasn't easy." So today's tip o' the hat goes to my long-suffering Momma Reindeer. And since her birthday was yesterday she gets a sincere tip o' the birthday cap as well! 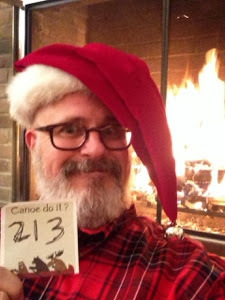 Oh, and in case you're wondering, if you happen to bag me in season, you've got yourself a 12-pointer -- and a one-way ticket to the naughty list!